I recently came across this article on Fast Company about an entrepreneur who has a kickstarter campaign going for his new "Cardboard" standing desk. Before we go too much further, let's just clarify, this is desk is made of corrugated board, not cardboard. Not sure on the difference, check out one of earlier blogs here. Interestingly enough, Zach Rotholz, the designer behind this standing desk actually has a retail store in New Haven, CT called Chairigami where he designs and sells all sorts of furniture from corrugated. Chairigami produces everything from beds to chaise lounges and now has expanded to manufacture both office furniture and trade show booths for a national audience. All of the pieces are hand-made and produced in his small cardboard carpentry style store. 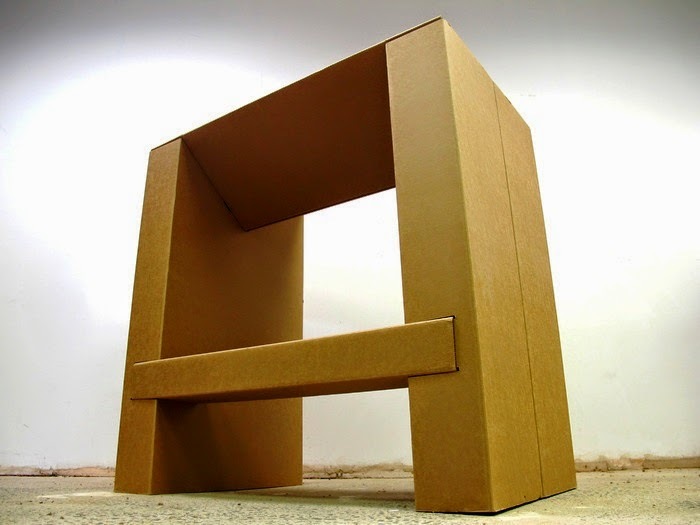 The paper based furniture ends up being relatively inexpensive, very light to transport and move, plus completely recyclable when you are finished with it. The featured standing desk is said to weigh less then 15lbs, strong enough to support 300 lbs on the top surface, assembled by customer in a matter of minutes without any tools, fastener or adhesives and last 4 years in a normal working environment and all that at a price point of $65. One of the main pitches is why would you spend several hundred dollars on a new standing desk only to find out that you really don't like it. 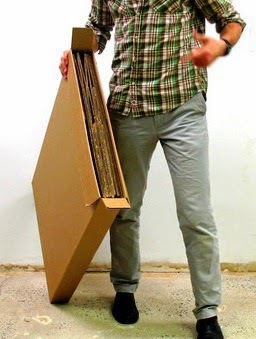 Ironically, the other most cost effective option for "trying" the standing desk out would be just to find some old corrugated boxes and set them on your current desk. The other fun advantage is that these are fully customizable with simple box knives or markers and if you don't like it, pretty easy to replace or fix. Just keep these desks away from water, corrugated and moisture don't get along, kind of like the Movie Gremlins from the 80's. Not sure if this is take over home furnishings for the majority of households, but I could see a nice niche for small apartments or student housing. But I think the biggest market might be for trade shows. Don't be surprised if you see our Chainalytics design team working on some new corrugated furniture designs for our upcoming trade shows! Corrugated boxes are cost efficient with additional savings to be considered since risk of damaged products shipped is eliminated.